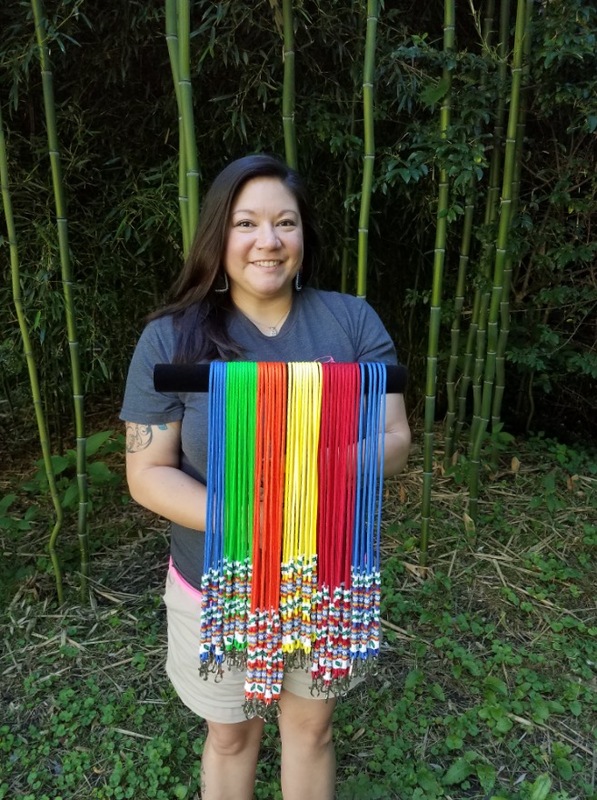 For the 2016 Folkmoot Festival, Lisa Wilnoty, Folkmoot Cherokee Coordinator, designed hand-beaded lanyards for staff and guides. Lisa wanted to create something for the guides and staff and thought these lanyards would be a great gift to symbolize the friendships and unity that Folkmoot brings. The beaded lanyards were such a hit within the Folkmoot community that we have asked her to make more for the 2017 Festival! Lisa began beading about three years ago when she decided to pursue her passion for traditional crafts. Her husband, Freddy Wilnoty II, showed her the basics and from there she began creating her own designs. When designing these beautifully beaded lanyards, Lisa incorporates an array of colors, especially watercolors to be used as a representation for how water gives and sustains life. This year she chose green and white for growth & peace. Many of the guides and staff look at these hand-beaded lanyards as a symbol for Folkmoot 2016 and all the wonderful memories from the festival. They all recognize the hard work that Lisa put into making these special gifts, and were humbled and honored to receive them. Some of the individuals who were given these lanyards still use them to hold keys or badges in everyday life as a reminder of the friendships they made during the 2016 Festival.